You are here: Home / Marketplace / Who is this member on eBay auctions? Who is this member on eBay auctions? How many times have you been outbid on eBay by someone using encrypted userid such as a***n (private)? Would you like to contact this buyer and offer him a trade for the item you just lost in highly competitive biding? 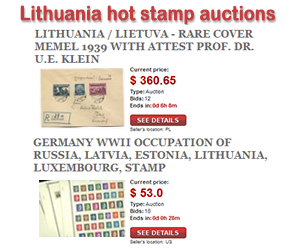 Or perhaps you are just curious about other collectors who regularly purchase Lithuania philatelic items. Do you have a clue who this bidder might be? Ebay put this security feature in place to protect sellers and buyers, the encrypted userid is randomly generated and we do not have possibility to decode it. Here we started listing of regular and encrypted userIDs of collectors who frequently purchase Lithuanian stamps and postal history items.